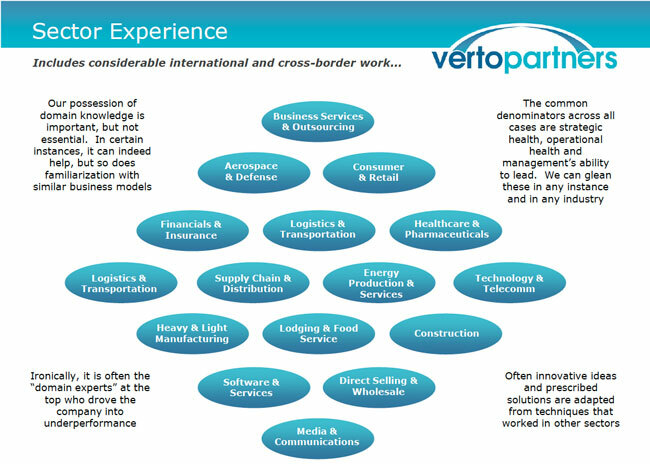 Verto Partners is largely defined by its unprecedented track record in the actual business of turning around corporations in numerous industries. Our case history of leading “mission impossible” situations has yielded stellar investment returns for stakeholders, and derives largely form our proprietary assessment methods, uncommon 360° perspective, leadership instincts and team design. Our sweet spot is any situation that requires a comprehensive view of the company’s strategy, operations and finances and at the board level. This is where we are world-class. While we have performed numerous stand-alone financial restructurings, we are most valuable in developing and leading initiatives that are aimed at actually improving corporate performance.